When it comes to home grown produce, tomatoes are likely the easiest to preserve. Q: How many tomatoes do I need for canning? 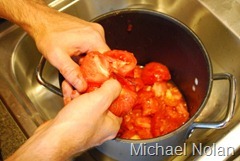 A: For 7 quarts, which is an average canner load, you should start with approximately 21 pounds of tomatoes. Q: What is the easiest way to can tomatoes? A: For a beginner, the raw pack is probably the easiest. Start by slicing an X through the skin at the base of each tomato. Place the tomatoes into boiling water for 15-20 seconds before removing them carefully into an ice water bath. When cool, the skins will slide right off. Next you should carefully remove the core stump (nobody wants to eat that) and cut the tomatoes into equal sizes, whether whole, quartered or diced. 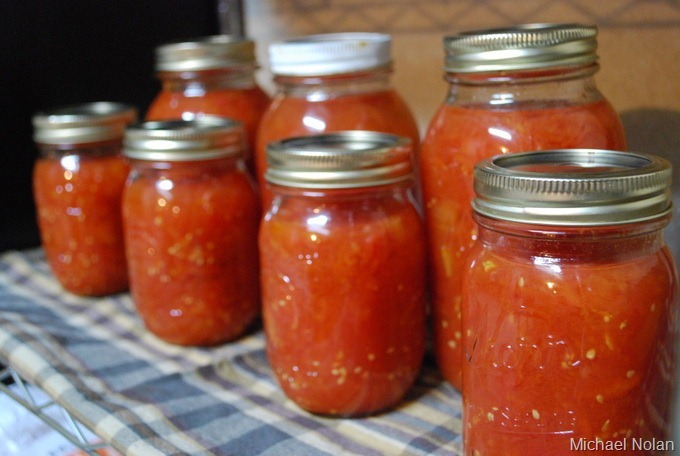 Place equal amounts of raw tomato into each sterilized jar (if you have a dishwasher this makes it much easier!) and fill to 1/2” from the top. This is called “headspace”. At this point, you may opt to add lemon juice to each jar to ensure adequate acid for preservation. I generally use no more than a Tablespoon per quart, though the National Center for Home Food Preservation recommends two. Fill the jar with boiling water, keeping the same 1/2” inch of headspace. Wipe the rim of each jar carefully to remove any residue and add lids and rings. Tighten the ring to hand tight, then back it off slightly. Add to a boiling water canner and process in boiling water for 45 minutes (quarts). NOTE: Higher altitudes may need longer processing time. 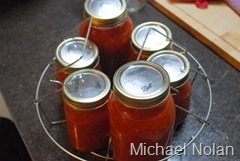 Remove the jars from the canner with a jar lifter and allow to cool at room temperature. When the jars are properly sealed you will hear the tell-tale POP!